There's something to be said for a couple who likes to play together. Ben and Alicia don't take themselves too seriously, and you can see they have so much fun. It was important for these two to show their sense of humor during their engagement session - and I'm a big believer in having your session be fun and reflective of your interests and personality. One of Ben and Alicia's interests I can totally get behind? A great cup of coffee! After a short getting-to-know you chat at Boji Stone, we started out walking around downtown. Ben and Alicia wanted to incorporate many of the murals painted by local artist Kelly Poling. These larger-than-life murals are truly something to behold, and are worth a road trip to Chillicothe in their own right! Ben is the Executive Director of Main Street Chillicothe, and you can tell how much he loves serving his town. That's one thing about Missouri small towns - the pride of place and tradition is very apparent, as well as the fostering of relationships and supporting local business. It's something I love about the Midwest and the people who live there. Also, did you know that Chillicothe is truly the Home of Sliced Bread? Now that's a good thing! After my whirlwind tour of Chillicothe, we ended up at the park with a cooler full of water balloons. Luckily, it was a typically hot and humid Missouri day, so it was perfect for a water fight! I won't say who threw the first balloon, but let's just say these big kids took no prisoners. By the end of our session, they were both drenched and laughing like crazy! 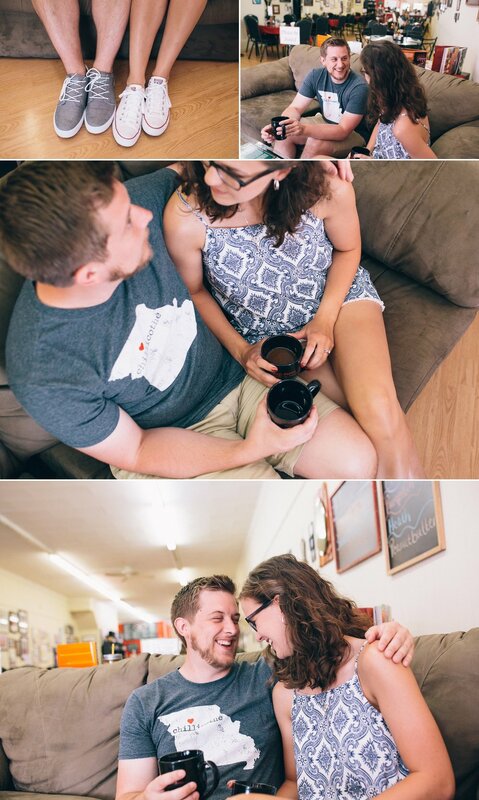 Ben and Alicia will undoubtedly carry their sense of fun forward well past their wedding day. Congratulations, you two! Can't wait to be there soon to photograph your best day ever!